Citation Information: J Clin Invest. 2014;124(6):2299-2306. https://doi.org/10.1172/JCI72267. Fibrosis is a characteristic feature of all forms of chronic kidney disease. Deposition of pathological matrix in the interstitial space and within the walls of glomerular capillaries as well as the cellular processes resulting in this deposition are increasingly recognized as important factors amplifying kidney injury and accelerating nephron demise. Recent insights into the cellular and molecular mechanisms of fibrogenesis herald the promise of new therapies to slow kidney disease progression. This review focuses on new findings that enhance understanding of cellular and molecular mechanisms of fibrosis, the characteristics of myofibroblasts, their progenitors, and molecular pathways regulating both fibrogenesis and its resolution. Photomicrographs showing fibrosis in the interstitium and glomerulus of a patient with moderate (stage III) diabetic CKD. 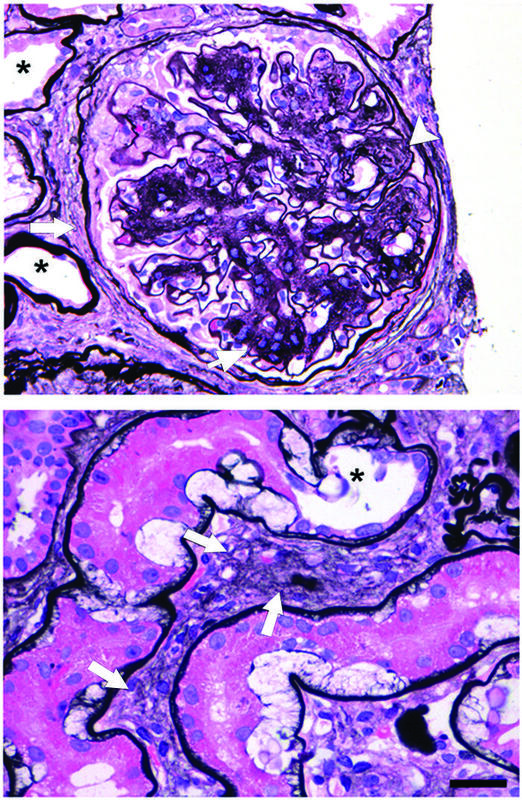 Silver methenamine-stained sections show fibrosis and basement membranes (black) in a glomerulus (top) and in the cortical interstitium (bottom). Glomerular mesangial matrix expansion (thin arrow) predominates, whereas glomerulosclerosis, which includes obliteration of capillary loops, can be seen (arrowhead). Injured tubules are widespread (asterisks) and interstitial matrix (thick arrows) is extensive in areas where peritubular capillaries normally exist, as is extensive tubular basement membrane thickening. Scale bar: 50 μm.